A little while ago, I had great fun with the embossing paste which resulted in a few backgrounds sitting waiting on my table to be used! This is the last from that batch of backgrounds! I had used Smoky Slate cardstock and coloured the embossing paste with Tranquil Tide ink before using it with one of the Pattern Party masks. To add a bit of seasonal bling and to give Santa something to stand on, I added a couple of strips of the Year of Cheer Washi Tape to the background piece and adhered one of the Foil Snowflakes (well, to be honest, it's 3/4 of a snowflake - waste not, want not!). There's also a thin edge of Silver Foil Sheet behind the main panel. Following my "waste not, want not" approach, I cut out the centre of this piece of foil to save for use elsewhere. 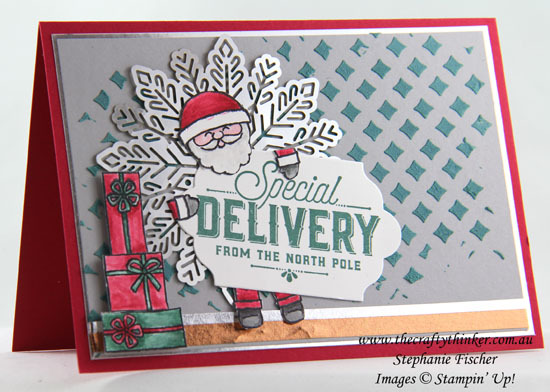 The stacked gifts are from the Ready For Christmas stamp set, and I adhered them with Mini Dimensionals. 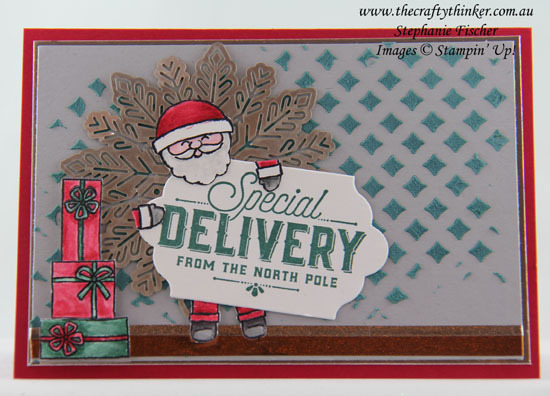 The greeting is from the Merry Little labels stamp set, stamped in Tranquil Tide onto Whisper White cardstock and cut out with one of the Lots of Labels framelits. I'm not sure how good a grip Santa has! I stamped the Santa image from the Cookie Cutter Christmas set and coloured his head and extremities. Instead of using the matching Cookie Cutter Builder punch, I fussy cut his head, arms and legs and adhered them to the label so that it looked like he was holding up a placard.